Anyone attending a Roller Derby Coalition of Leagues banked track game last year—particularly in Southern California, the nerve center of organization—would have seen many of the same gameplay problems that have been recently plaguing the WFTDA flat track game. Slow, boring, and sometimes unfair gameplay; blocker disengagement and no-packs during power jam point-go-rounds; and lengthy official timeouts to clarify calls or communicate penalties between jams. Though the problems were very similar between derby disciplines, the urgency to fix them is much, much more paramount in the RCDL. Operating expenses for banked track leagues are exponentially higher than those of their flat track sister leagues, and as the only realistic place the income to cover those expenses can come from is fans and the sponsors they attract, something quickly needed to be done to get things back on track and make it fun for fans to watch once again. For me personally, watching an RDCL game was often an exercise in tolerance. In the latter half of 2012, some games in L.A. got to the point where I couldn’t tolerate them anymore and had to walk out during the third quarter to save my sanity. It was not a good situation to be in. In response to these issues, the RDCL released an updated ruleset late last year for use by its banked track roller derby leagues. The document wasn’t final at the time, with the first half of the new year pegged to be a working beta period to iron out the kinks. A few weeks ago, the updated and finalized 2013 rulebook landed. Now at version 2.3, it may have very well hit the sweet spot how it juggles the unique issues the organization and its member banked track leagues are currently facing. The biggest issue of all, one exclusive to the RDCL, is that the number of banked track leagues using their ruleset is extremely small—about 15, give or take—and is not liable to grow in number any time soon. The small talent pool available means that teams of vastly different skill levels will have no choice but to play each other, for lack of options, requiring a ruleset that makes potentially lopsided games competitive, yet action-packed and fun to watch during all phases of play. Having seen quite a few banked track games played under the ruleset this year, let me be the first to say it: Mission accomplished. Games are fun to watch again! Here is a look at some of the major points in the 2013 RDCL banked track roller derby ruleset, including how they have simplified and improved flow for uninterrupted gameplay, how they have made things more fair for teams in various phases of play, and yes, the solution they have cooked up for putting the jam back into power jams. The starting formation players line up in is very important in dictating how the initial pass, and often the entire jam, will play out. The best example of this is how teams are desperate to start a jam at the rear of the pack, as close to the jammers as possible, in order to gain the advantages that have long been associated with doing so. The RDCL recognized that in their game, a team starting with a rear 4-wall will generally keep it through the initial pass and even through subsequent scoring passes. (Teams at the front could not drop back to recycle, since stopping or skating counter-clockwise is illegal in the RDCL.) During power jams, it was even worse; teams could easily win multiple scoring passes without ever engaging their opponents. In an attempt to prevent these pre-jam back walls from forming and give the other team a fair shot to break them apart after the jam begins, the 2013 RDCL rules made two significant additions to the jam start rules, and one general gameplay rule, that have made a big impact on the start sequence. The first change to the start rules has put the pivot back where it belongs. 3.3.2 One (1) pivot from each team must be fielded in each jam in the Pivot start box in order to start the jam. The Pivot constitutes one of the four (4) blocker positions. You’ll notice a pretty strong word in here, that being “must.” In the new RDCL ruleset, the pivot is now a mandatory position that absolutely must be on the track for every single jam, for both teams. Among other things, this means that if a pivot commits a penalty during a jam, the player will serve the box time in the next jam, but not the stripe; or if blocker penalties reduce pack strength down to the two-blocker minimum, one of them will always be pivoting. The new RDCL jam start formation for 2013. Note how the pivots have a segregated starting area ahead of the blockers. To prevent this, the new rules take the pivot from each team out of the blocker start area and places them into a new two-foot wide starting box, effectually known as “Pivot Alley.” This new formation vertically stretches out the pack and opens up more space around the blockers at the start, eliminating a team’s ability to wall up from the get-go. As a result, jam start positioning is much more fair and equal for both sides, regardless of bench positioning or pre-jam shenanigans. If a team wants to get all their blockers to link up and form a solid wall across the track, either at the front or the back, they would now have to go through the other team—forwards through the pivot, or backwards through the other team’s blockers—in order to earn that positioning. This is what makes it a fair start: Both teams have the same chance to get what they may want, and prevent the other team from getting what they may want. Having spaced out the pack from front to back, RDCL turned their attention to evening the odds across the track, from the outside to inside. The handrail on a banked track can often act as a sixth player for a team savvy enough to know how to use it as a defensive tool. A blocker can pin an incoming jammer up against it and have teammates swoop in to lay down the hammer or act as a fence to prevent them from coming off it and trying another route around. In the old RDCL rules, playing defense against the rail gave a team doing so an unfair advantage. It was legal to clutch onto it with their hands and form a near-impenetrable seal on it, use it for stability during a block, or take advantage of its leverage in concert with a defensive wall. This ability contributed to many messy jam starts, since whoever was holding the back wall at the outside rail would know the incoming jammer wouldn’t be able to do much to move that blocker forward without resorting to forcefully—and often, illegally—dislodging them. 6.8.1.2 The rail can be considered a partner for multi-player blocking. Skaters may not grab, grasp, or link with the rail in order to block or impede an opponent. In watching games played under the new rules, compared to what they looked like under the old rules, this was the most immediately noticeable change. Especially at the start of jams, where the blocker covering the rail could no longer hold on for dear life and wait for the opposing jammer to crash into them. Now the first line of defense is more liable to skate forward a bit in an attempt to match speed and crunch the jammer into the rail, killing their momentum. If they miss, however, that momentum will let the jammer create and then break through the gap between the blocker and the rail, making the defensive play more about skill than about brute strength. This change gives a jammer more options to get through the pack, not only during the initial pass but any other time a pack has slowed down during other phases of play. Together with the main aspects of the new jam start formation rules—the spacing out of the pack blockers and the pivots waiting up front to block or assist, depending on which jammer gets through first—it makes for much more fluid action right from the jam start whistle. As a bonus, it also makes it easier for new fans to understand what’s going on during jam starts. Even if they don’t know exactly what the pivot position does, at least the consistency of seeing striped-helmet players start every jam at the front of the pack every time makes it simple follow. I’m told the RDCL factored this into their decision to make the pivot a mandatory position, which is smart thinking. The RDCL really gets the “for the fans” aspect of roller derby. In addition to looking at areas to improve the action during play, they also focused on cutting down on game delays, wanting to reduce or eliminate the unnecessary stoppages and limit necessary clock stoppages. Nothing breaks up the flow of a really fun and entertaining game than a noticeable stretch non-entertaining un-fun, after all. To that effect, this year’s RDCL rules have done a lot to keep the up-time up and the downtime down. 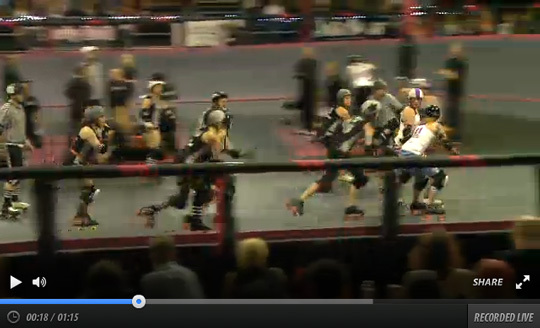 Like the WFTDA, the RDCL has switched to a no-minors penalty system in 2013. Tracking minors was always messy regardless of the rules being used, but it was messier on the banked track since outside officials can’t easily communicate with the infield and inside officials can’t relay a message to the outside without calling timeout to send a runner under the rail. Simplifying penalties has made between-jam penalty communication a snap. The improvement in this area is so obvious, referees and teams are often ready to start the next jam before the players in the preceding jam have come off the track. Which makes you wonder: If the officials are ready, and the players are ready, but there’s still time on the lineup clock, why keep the fans waiting? Blow the damn whistle and get on with it! The RDCL doesn’t wonder that. It’s exactly what they do. 2.5.3 Between jams, a team has thirty (30) seconds to get into formation. If both teams are in formation with helmet covers on before thirty (30) seconds has elapsed, the referees may start the jam. Though not a rule new for 2013, the truncated reset is much more prominent now that the administrative and formation changes elsewhere in the rules have made life easier for everyone between jams. If everyone is in position to go, and everyone knows everyone else is in position to go, a moment passes, the start whistle sounds, and they go, even if there are several seconds of reset time remaining. The start formation rules provide a hidden benefit to this setup. There is no five-second warning before the jam start whistle, because there doesn’t need to be; the fact that both teams have placed themselves in their ready positions is their “warning” that the jam is about to start. If a team isn’t ready (or they want to burn off all 30 seconds of the reset clock for strategic reasons) they can simply delay putting one of their players, particularly the pivot, in their designated start area without positionally disadvantaging their team. The improvement this brings to RDCL games is dramatic. In the old rules, jam resets often took the full 30 seconds, and sometimes more than that, to make sure the proper number of players and/or helmet covers were on the track. The amount of time this ate up meant 60-minute games averaged about 52 live jams. But in the new rules, thanks to trimming the fat off of reset time and banking the saved seconds between every jam, that number has shot way up. With as little as 15 to 20 seconds between jams, games in Los Angeles have recently been churning out over 60 jams in 60 minutes, with one game hitting a remarkable 64 jams! The short resets give the illusion of constant action on the track, with the end of a jam and the beginning of the new jam almost blending in to each other. This effect makes it feel like you are watching something with the uninterrupted flow of a hockey game, instead of the jerky stop-start flow of a football game. It’s wonderful. 6.19.1 Delay of game penalties are issued when a team or skater delays the flow of the game. 6.19.3 If a delay of game occurs the Head Referee (HR) for the game has the ability to hold the game clock after thirty (30) seconds [the jam reset break] has expired instead of calling an official time out to improve game flow. Here’s a new penalty category that’s very similar to the one the WFTDA added to their rules this year. However, you’ll notice that the rules explicitly state an official timeout need not be called in order to issue the penalty. This is important in the RDCL, because any timeout requires players to leave the track and return to their benches, turning any “short” OTO into a noticeably long one. If a Delay penalty is spotted by the officials, instead of calling for a time out, waiting for players to leave the track, communicating the penalty, calling time-in, waiting for the players to return to the track and line up, blowing the whistle to start play, and wasting all that time in the process; they just auto-stop the game clock at the end of the 30 second reset, pull the offending player off the track, put them into the box, and then blow the whistle to get on with it. Long story short, what might have taken a minute in the old rules would take only 10 seconds in the new ones. Basically, there’s no need for the enforcement of a delay of game penalty to delay the game even longer than it has to, if it can be helped. When you give officials some flexibility to keep the game moving when the situation allows it, everyone benefits. 9.4.2 Each team is allowed three (3) challenges per game. They may be penalty or points challenges. 9.4.2.2 A team must have at least one (1) team time out to call for a challenge. 9.4.2.4 If a team loses a challenge, they also lose one (1) team time out as well. Like in the NFL, if a team wants to challenge an official ruling the assumption is that the referees got it right the first time, and a team wants to challenge that assertion needs to have the ability to stop the clock—that is, have a timeout available—in order to do so. The RDCL uses the same system, which effectively guarantees that any clock stoppage is never time unnecessarily wasted. Since the result of a challenge can’t be determined beforehand, the initiating team needs to have a timeout as collateral in case the challenge fails. If it does, they’ve wasted everyone’s time in trying to overturn a call that was correct in the first place, effectively making it a stupid waste of a team timeout. If the challenge is successful, on the other hand, the clock stoppage acts as if were an official timeout used to correct a call that they got wrong in the first place, thus justifying the stoppage. This seems a trivial difference, but the little considerations like this one and the others in the rest of the rule book all add up to make games feel like they’re moving lighting fast. Frankly, some RDCL games this year have felt like they were way too short, despite being the same length of some of last year’s games that felt like they went on forever. Sixty minutes of gameplay feels a lot more action-packed if there are barely any game stoppages to break it up. Although, a major contributing factor to that may how the new RDCL rules have effectively killed the sausage and gotten the game moving faster on the track than it’s been for quite some time. Pack definition is the perpetual trouble spot for modern roller derby and its current rule variations, as ever. It was clear to the RDCL that the established way of doing things had failed. They therefore needed to come up with a better solution to accommodate the wide skill gap in its small group of teams that not only kept things moving in the pack, but at a nominal pace that wouldn’t overly advantage fast teams, disproportionately advantage slow teams, or unfairly advantage any team trying to cheat the system. The solution they came up with is a pretty good one. Although, you can’t immediately tell that from looking at the text of the pack definition rule, which is nearly unchanged from the RDCL rules of last year and only slightly different from the concept seen in the common flat track world. 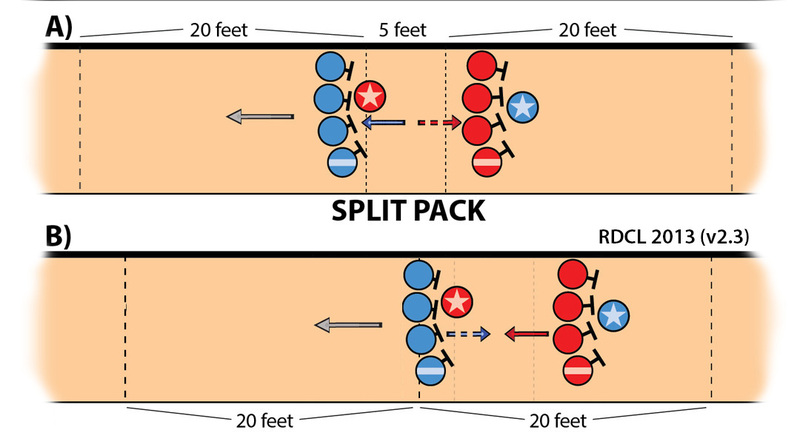 4.1.1 The pack is defined by the largest group of upright, in bounds Pivots and Blockers, skating in proximity, containing members from both teams. 4.1.1.1 Proximity is five (5) feet. The pack is still required to have both teams in it, as it has since all the problems stemming from defining it started to show up. When teams play nice and meet this requirement, there are typically no problems with gameplay. Where the trouble happens is when one team decides that staying in pack proximity doesn’t work to their advantage and goes about trying to deliberately get out of it. To help with this, proximity has been knocked down to a scant five feet (down from seven in previous RDCL rule versions) practically requiring teams to be on top of each other in the pack even if they have a reason to not want to be. But the biggest change to force teams to keep it together is what happens when the pack splits and no pack can be defined. 4.2.2.1 During a split pack, the engagement zone is measured from the foremost group of skaters skating in proximity on the track. … All blockers within the engagement zone may block and assist during a split pack, but all blockers must simultaneously and immediately attempt to reform the pack or risk penalties. Previously, the RDCL had been using the WFTDA model to handle a no-pack situation, where no engagement zone can be defined (since there is no pack to anchor it) and no one may engage until the pack is reformed. This isn’t a problem on paper, as the pack players are tasked with reforming the pack immediately, and therefore the engagement zones should reappear immediately. The new RDCL split-pack rules solve the problem of deliberate disengagement to gain advantage by taking away the advantage in deliberately disengaging. Now, a team can no longer laze around at the back and make the engagement zone disappear, because the engagement zone is persistent no matter the current status of the pack or what a team tries to do to manipulate it. This clearly and concisely allows players to block anyone, anywhere during any and all times a pack cannot be distinctly defined, because an engagement zone always will be. A) When pack proximity is being met, a 20-foot engagement zone exists ahead of and behind the players, just like normal. However, when no pack can be defined and a split pack is called… B) The engagement zone is redefined to anchor at the foremost group, extended both directions, persisting in this form until the pack snaps back together. Even with this new ability, players on both teams are still required to immediately reform the pack, with the group behind needing to speed up and the group ahead needing to slow down. Failure to do so results in penalties. But the way these penalties are enforced is what ultimately prevents either team from overly exploiting the rules and makes the pack-package come together. 6.11.1 If at any point the definition of the pack cannot be met, officials will give a split pack warning and an attempt to reform the pack must immediately be made by one member of each group on the track or penalties will be assigned. 6.11.3 Penalties will be first assigned three (3) seconds after the warning, and at every (3) second interval until the pack is reformed. This three-second buffer period lets a team initiate a pack speed change, sometimes quite rapidly, without risking immediate destruction of pack penalties that may have come in the previous RDCL (and current WFTDA) rules environment. The opposing team or mixed group of pack players must respond, per the rules. This still, unfortunately, allows for situations where a team in the back can slow down their opponents without needing to block them—a major no bueno in the sports world. Despite this, the scale in the pack balance equation has now decidedly tipped in favor of a team that wants to use this buffer to keep the pack moving forward. Should a team get to the front of the pack, they can speed forward for a moment and legally induce a split pack, requiring that the rearward group pick up the pace to do their bit to reform. The team forcing the speed change must still hit the brakes and slow to do their part to reestablish proximity, but the net result is a pack that has increased in speed and covered some distance on the track. Where this has the most impact is during power jams, where the team down a jammer finally has a fair chance to put up a defense. Previously, the offensive blockers at the rear of the pack, not containing an opponent, needed only to maintain required forward motion—tip-toeing forward, basically—wait for the defense to skate forward to induce a no-pack, then watch their jammer skate on through for a free five-point pass. With the new rules, the “free pass” part of the equation has been eliminated. Should a team try to sausage on the banked track, they’ll get the temporary benefit of a speed reduction and maybe a blocker slowing down and becoming separated from the front wall, creating an easier target for the offense to goat and trap behind them. But these benefits have been equalized by the fact that everyone in the front wall can still continue to block the jammer. Additionally, should a lone blocker need to peel off behind the jammer to help reform the pack, once proximity has been reestablished they can just scoot forward again to force the other team to keep the pace up. Befitting of the large skill gap seen in the small number of RDCL banked track leagues, this system produces a middle ground between the no-skill, no-speed pace of power jam packs too-often seen in WFTDA games, and the high-skill, high-speed packs you might sometimes see during a USARS power jam. 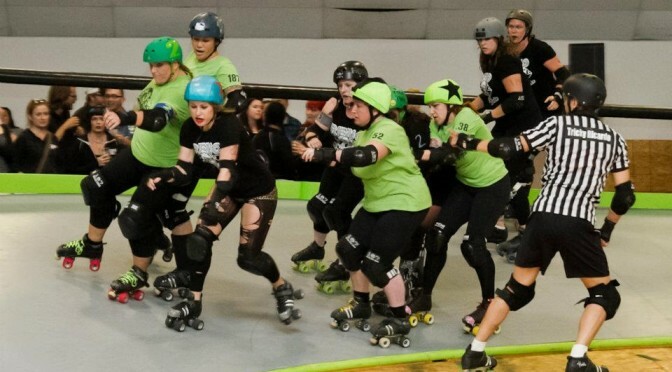 In this L.A. Derby Dolls power jam against a fully depleted Rose City pack, the players at the front of the pack alternate between speeding up and slowing down, as if an accordion or slinky is being stretched and compressed repeatedly. They can’t put the pack into an outright sprint, and the other team can’t bring the pack to a grinding halt. So you get this instead. It may very well become the go-to-play in the RDCL as teams get more and more familiar with game strategy. Teams are beginning to rediscover that the best defense against a power jam is to keep the pack moving as fast as it possibly can. Beating the other team’s blocks to get to the front, then staving off their attempts at capturing a goat by rubber-banding the pack-blob forward, is already starting to become a big option in power jam defense. But even if teams play a more conventional defense, the simple fact of the matter is that power jam scoring in RDCL games so far this year has completely bottomed out. Not getting 10 points in a power jam was considered disappointing in the old rules; now, a team picking up five points has done a pretty good job. And if a team gets a goat and keeps it, 15 or even 20-point bombs can still drop. Basically, it’s almost just as difficult to score points in a power jam as it is to score points in a regular jam. For that reason, one must conclude that the pack solution RDCL has come up with is a damn good one. Not only for them, but potentially for roller derby and its quest to move forward.